You are currently browsing the tag archive for the ‘Hayao Miyazaki’ tag. We trotted out the family to see the new Hayao Miyazaki–Ghibili movie this past weekend with the kids, and weren’t disappointed. Well, now we know why, the Studio promoters must have been worried that the biopic story of the invention of the iconic Mitsubishi A6M Zero fighter plane and the inventor Jiro Horikoshi would become a hot potato of controversy, given that it is the symbol of Japanese imperialism. The movie, however, focused squarely, in the spirit and tradition of Miyazaki, on the development and fleshing out of the key characters … And the anime film has all the great hallmark stamps of the Miyazaki movie, masterful storytelling, and it was a story of young Jiro’s coming of age, his romance and love story with a girl from the other side of the tracks, beginning with the events of Great Kanto earthquake of 1923, following Jiro’s entry to the working world, and through to the days of rumours, rumblings of and the readying for WWII. Jiro is a character that many kids will like or relate to, a boy forever with his head in the clouds literally, fixated on perfecting or improving his paper airplanes (incredibly like my son) and his later utter absorption and passion for his art/aviation engineering science. It is obvious that Miyazaki made this movie with a determination to reach and inspire the Japanese youths of today … to reach for the sky, follow their dreams in the face of adversity, poverty, disaster and against all the odds. The movie’s title (based on a French quote by Paul Valery) itself gives the imagery of rising on wings of an eagle, and of seizing the day… and living to the fullest. On the art of the movie: It is everything we love of all the greatest Ghibili hits, reminding me of scenic beauty of Laputa a little, with its very European feel to it, and the many scenes set in the posh Karuizawa mountain resort, a favorite of the Japanese Royals and elites. 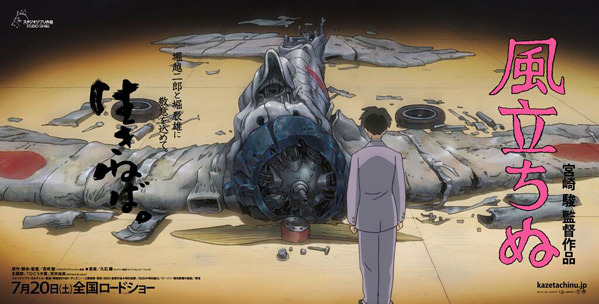 The movie, however, resembles more the Graveyard of the Fireflies with some of its pathos, than the recent series of fantasy-related high-octane action anime that Ghibili has turned out. Some reservations: The bittersweet romance, great success combined with personal loss of Jiro is an aspect of the tale, as well as the dark war history of imperialism, does, however, differentiate this movie from most of the other Ghibili movies. It feels a little more grownup and lacking in childish themes, — which makes me think that the movie may be a bit slow in parts for the very young, and perhaps more suitable for kids from grade 5 or 6 onwards. The complex animation and exquisite detailed art of the earthquake and the many failed test pilot scenes (are reminiscent of all the great inventor stories like the Wright Brothers) …will however, add humour, delight the audience and perhaps be enough to keep the attention of the younger ones. The movie is in itself fairly educational, imparting to kids a fair bit of information about the Zerofighter, life in Japan before the war, and best of all, will probably inspire considerable summer reading especially in boys. The Zero, so named because of its carrier-based Type O designation, had retractable landing gear and with external drop tanks had a range of 1,929 miles. It exceeded the Japanese Imperial Navy’s specifications with a maximum speed of 331 mph and a ceiling of 33,000 feet. The keys to its superiority were speed, range and maneuverability (see Science, How Stuff Works. Read more about The impact of the A6M Zero Fighter aircraft in WWII ). All in all, a must-watch life-affirming movie inspite of the darker connected backdrop of war destruction and militarism. Kudos to Hayao Miyazaki for trying to help Japanese youth move past their dark demons of war history. Blog away and grow a tree! Countering radiation damage and contamination: Anticancer cures, quick detoxes or quackeries? Free Brain Games at "Luminosity"